The Cosmopolitan Cafe has been around since 1985 (according to the menu), but I’ve never noticed it before. It’s not surprising as it’s not in my hood for a start, and I don’t generally hang out in cafes. 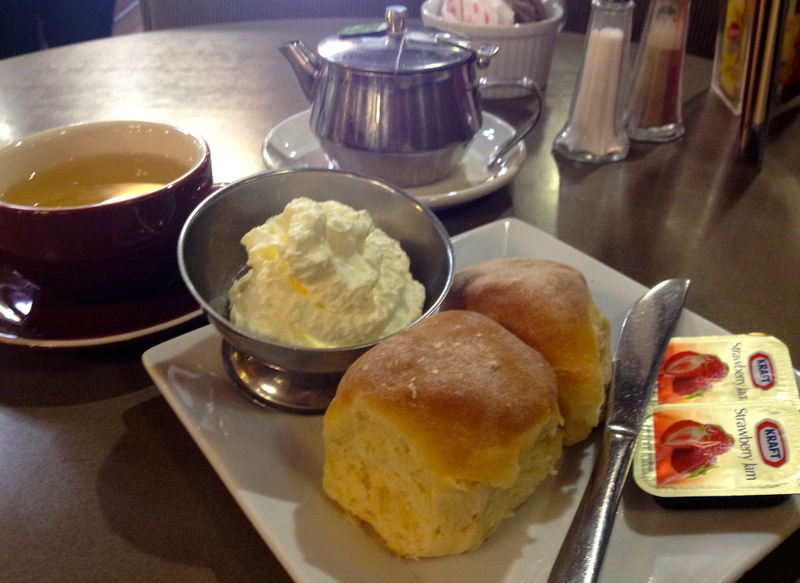 Today the knowledge that there are scones to be had has drawn me in from the Bondi Junction end of Oxford Street. It feels like stepping back in time with the walls lined with retro booths and the clientele that seem as though they have been coming here for the last 30 years by the familiarity they have with some of the staff. In regards to the Devonshire Tea, I had an idea what I was in for from a photo I saw on a blog post. How else did I know that they had scones? The small scones arrive bearing a sweet smell and become quite dry as soon as they cool down from being microwaved. I leave most of the crumbly remains as the cheap jam and lighter than light spray can cream doesn’t do them justice. Tea: A small selection of some loose-leaf tea and teabags served in a small teapot. Overall: Booths win me over every time.